Parking.com has convenient parking near the Port Authority Bus Terminal in NYC. Click on a location listed in the map below for parking rates, garage information, or a discount coupon. Please note: Customers must present coupon at time of exit to redeem discount. 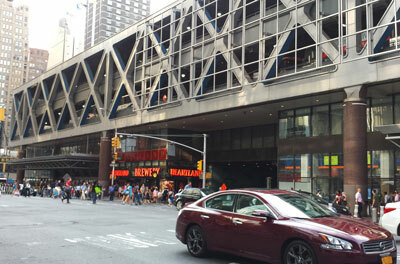 The Port Authority Bus Terminal is located in Manhattan's Times Square, and occupies the blocks between Eighth and Ninth avenues and 40th and 42nd streets. Connection is available to the A,C,E,N,Q,R,1,2,3,7 and S subway trains and to major bus carriers, including: NJ Transit, Academy, DeCamp, Greyhound, Megabus, Peter Pan, and Coach USA. The Terminal is also nearby many popular hotels and NYC attractions, such as Bryant Park, the Intrepid Museum, and Theater District.